A delectable way to discover Crete and its distinctive cuisine is by participating in one of the finest programs offered for food-culture enthusiasts and students alike: Crete’s Culinary Sanctuaries (CCS). CCS offers a variety of annual seminars on Cretan cuisine and culture, conducted in Crete’s rural communities, at historic sites, and on organic farms in mountain regions not usually visited by tourists. These seminars are unique not only on Crete, but in the international culinary scene because of their intensity of purpose. CCS was founded in 1997 by Nikki Rose, a Greek American professional chef, graduate of the Culinary Institute of America, writer, and culinary seminar director. She is also a responsible travel adviser for projects in Brazil, Cambodia, Europe, and the USA. These unique seminars have changed the lives of participants by enriching their understanding of how the preservation of culinary traditions actually protects precious food sources; this is called “sustainable practices.” The seminars have also contributed in very significant ways to preserving and protecting Crete’s precious cultural and natural heritage. These are ambitious goals and outstanding accomplishments. On the one hand, Ms. Rose has recruited a team of experts in the international culinary and nutrition field as teachers in her seminars and, on the other hand, has gathered Crete’s organic farmers, winemakers, chefs, home cooks, gardeners, fishers, and artisan food producers to be integral participants. Those enrolled in her seminars—the general public, professionals or college students who earn credits–go to the organic farmers, the home cooks and the fishers to learn from them in their own environments. Celebration of Crete’s Biodiversity and Historic Food and Wine Routes. For the general public, this seminar offers a mix of healthful eating and outdoor activity in regions of Crete, where many residents live to be a hundred years of age or more. Participants traverse hillside trails, observe wild thyme, sage, and oregano, and experience local wine-making festivals. Before the evening meal, there is a trip to the fishing docks, organic farm or markets to select the food that will be prepared and enjoyed with villagers. The evening usually ends with entertainment by local musicians playing the Cretan lyre and other instruments. Study Abroad—The Mediterranean Diet and Lifestyle–for university students and professionals. This is a two-week, accredited course offered in the town of Heraklion, several traditional villages on Crete and also in Athens. Students study different aspects of the Mediterranean diet through activity-related experiences, including visits to archaeological sites, organic food markets, farms, traditional tavernas, and olive oil factories. Students participate in interactive cooking demonstrations by expert chefs and occasionally harvest and shop for ingredients for their meals. The courses are taught by Ms. Rose and nutritional experts from various universities. Students are housed in locally-owned lodges, some of which are featured in National Geographic for best practices in sustainable tourism. Students learn about research that has been conducted on changes in life style that have occurred because of the Mediterranean Diet. 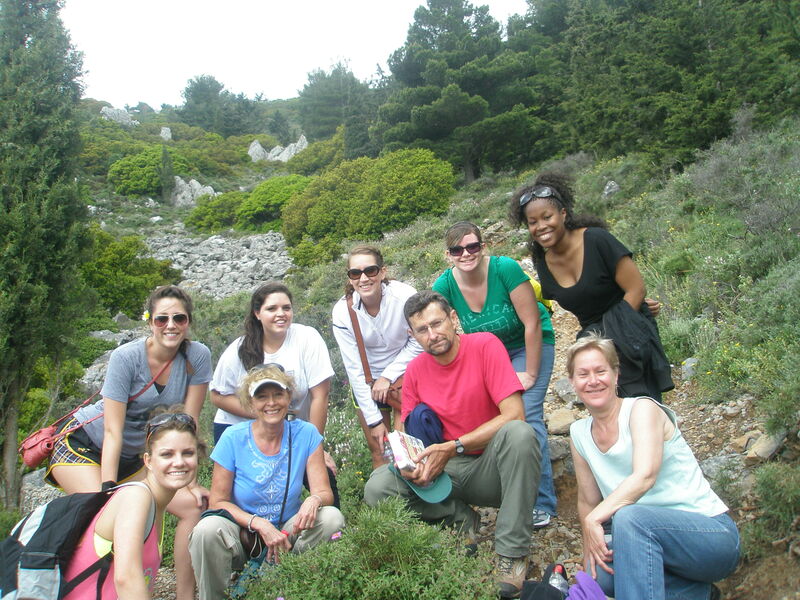 They go on guided botanical hikes to learn about native vegetation incorporated into the diet and the importance of conservation initiatives to protect Crete’s biodiversity. This is a culinary and cultural immersion course emphasizing sustainable tourism, organic and biodynamic farming, olive oil production and viticulture. It is perfect for students in Culinary Arts, Culinary Sciences, Hospitality, and Nutrition. Participants learn about the cuisine of Crete, which is the basis for the healthful Mediterranean Diet, along with other aspects of the culture, such as history, music and dance. CCS also organizes private group workshops/accredited continuing education programs for professionals in the healthcare and hospitality industries. These intensive workshops focus on the interrelationship between our safe and good food sources, cultural-agricultural heritage, human health and the health of our environment. 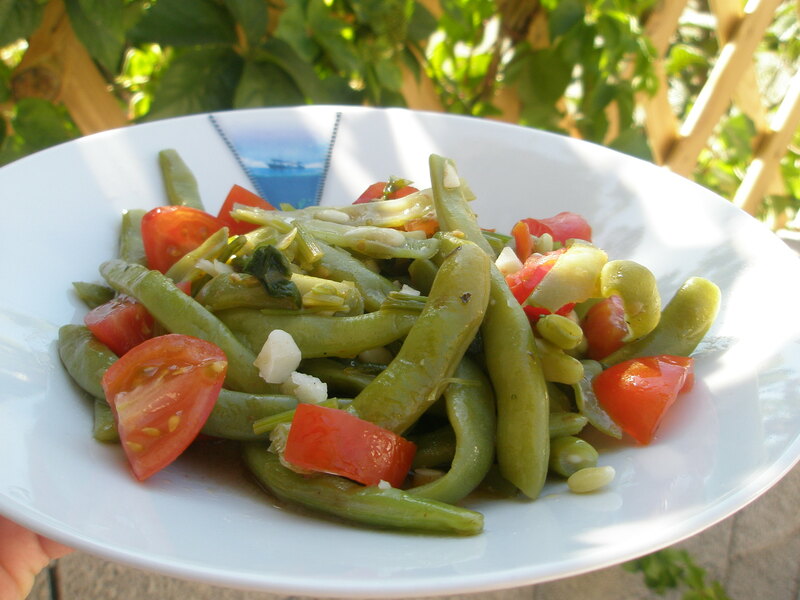 We eat a lot of beans in Crete. Some varieties are made into fritters (chickpeas and split yellow peas) and added to a long list of vegetable or meat dishes. Some are mashed and served as a dip along with other meze items. We also use chickpea flour for rustic breads. I like beans as the star of a salad. Certain beans make ideal medleys with certain herbs. 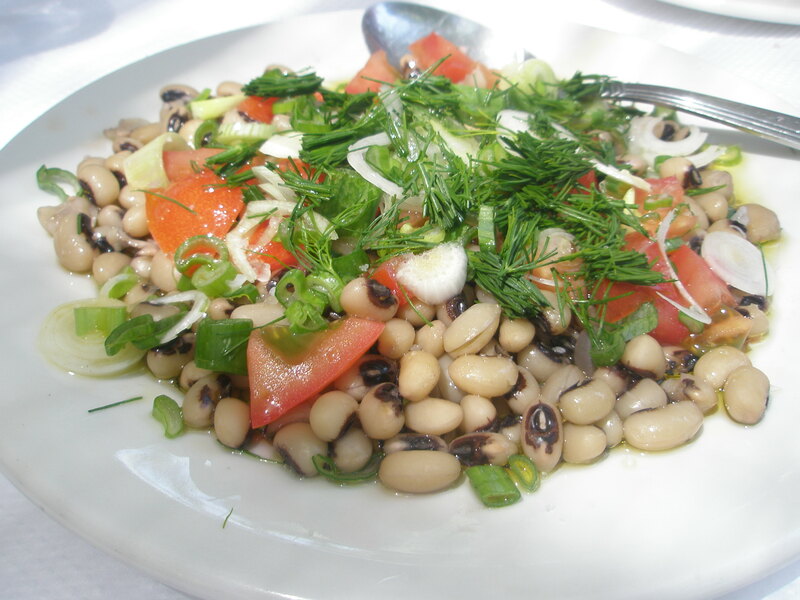 For instance, black-eyed peas with fresh dill is a fantastic combination. Lentils have a very robust flavor, so they hold up to powerful seasonings and garlic. Plan to make bean salads about an hour before serving (or overnight) to let the flavors meld. Bean salads will keep under refrigeration for 3 days. Mix all ingredients together, marinate in the refrigerator for at least an hour before serving. Some of my favorite meals have been created out of sheer laziness or lack of time. I like to find ways to retain individual flavors of vegetables I’m privileged to acquire straight off the plant. One-pot dishes are great but flavors can be lost due to high heat or overcooking. I want to eat good food even though I’m just as busy as everyone else. Chefs need breaks from the office too. My neighbor, Eleni, is a professional organic farmer. 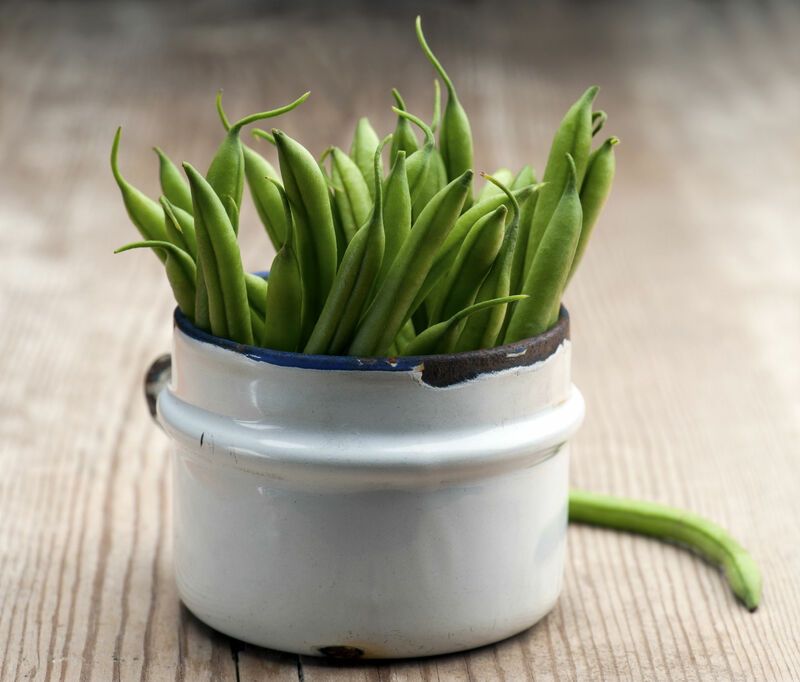 She gave me a sack of gorgeous string beans. I could have prepared them in the traditional Greek way — braised with aromatics. But they were so precious, I tried something different. Fill a stockpot with ½ inches of water. Bring to a boil. Add beans, lower heat and simmer until tender (about 5 minutes). Drain and reserve. 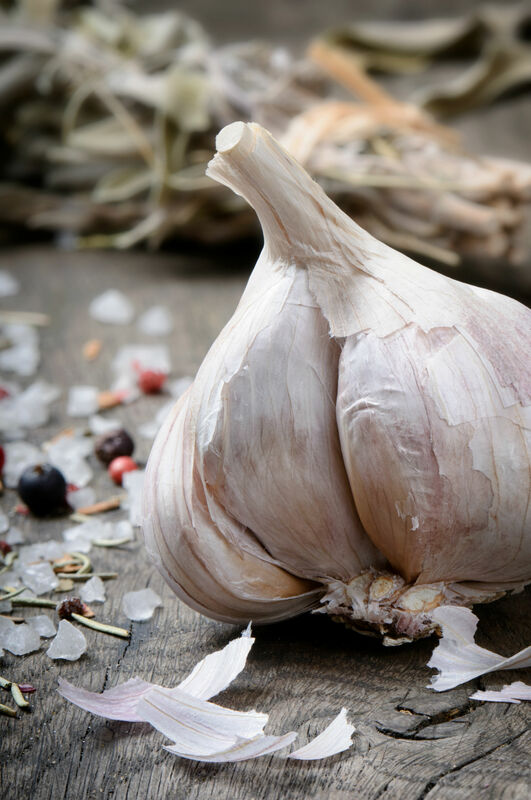 Return the pot to low heat and gently cook garlic in olive oil for 2 minutes just to take the raw edge off. Remove from heat. Add beans and remaining ingredients. Tastes great warm or at room temperature. In summary, Crete’s Culinary Sanctuaries is an award-winning program for best practices in Sustainable/Responsible Travel. Nikki Rose founded this program to help provide tangible support to residents working on action programs to protect their cultural and natural heritage. Ms. Rose and CCS have received numerous awards from National Geographic, the United Nations Convention on Biological Diversity, the UN-World Tourism Forum for Peace and Sustainable Development, World Travel, and Tourism Council. Ms. Rose frequently speaks at international conferences and is an adviser for sustainable tourism/culinary heritage projects around the world. Her book, Crete: the Roots of the Mediterranean Diet, highlights over fifteen years of her experience on Crete. Photos are courtesy of Chef Nikki Rose for recipes. She lives on one of the Greek islands for two months of every year, and in Pittsburgh, PA., for the remaining months. Aurelia specializes in writing articles and vignettes about Greece and has been published in all of the major Greek American publications in the United States, including The National Herald and The Hellenic News of America. Her articles have appeared, also, in Odyssey Magazine, The Athens News, and Stigmes, the magazine of the Minoan Lines. Her first novel, A Lone Red Apple, is set on Mykonos and is about life and love on that island. Aurelia calls it her love song to Sappho and her valentine to Mykonos. It is now available in a kindle version and has an "insider's guide" to the very best in dining and entertainment on the island. While reading the kindle version, you may click on links that will take you to the websites of the restaurants, bars, and tavernas.